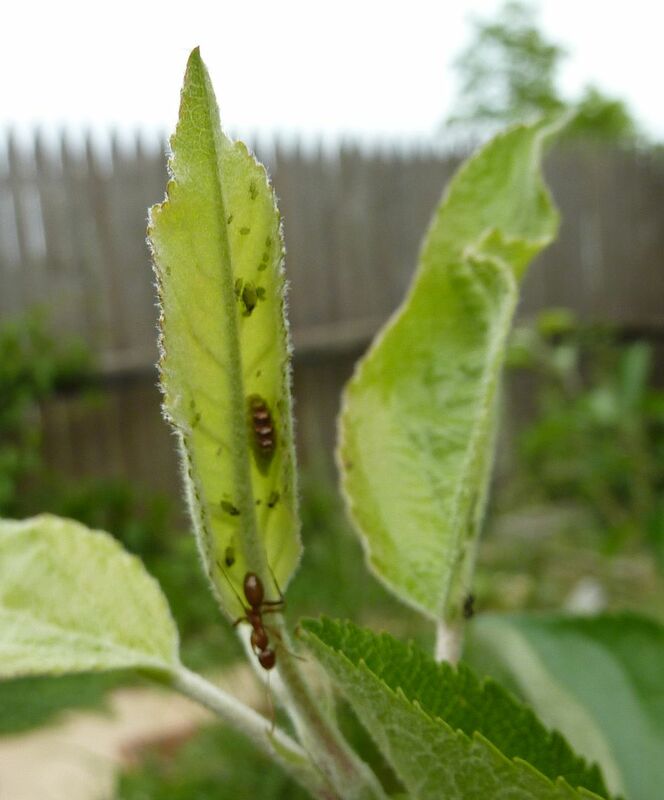 Biodiverse Gardens: What about Aphids? So yesterday I talked about things going wrong with my fruit trees. And these things are going to be problems as long as I don't spray insecticides and fungicides. So where are all the good guys in all this? So here is a patch of aphids under the protection of Tapinoma sessile. Yes the aphids are slowly draining the apple tree of it's energy. But that's just something gardeners say and usually over react to. These aphids are only on the new growth of the tree and one study pointed out at most they inhibit 15% of the tree's growth. I can live with that. The added benefit of having ants treating the tree as one giant food source is many of them are predators of caterpillars. Especially small ones that they can manage. Mostly though they have a harassing nature to other bugs and ants, especially if the other bug is to big for them to handle. Even so, a healthy colony can over take or limit where the pest insects are able to go on the tree. 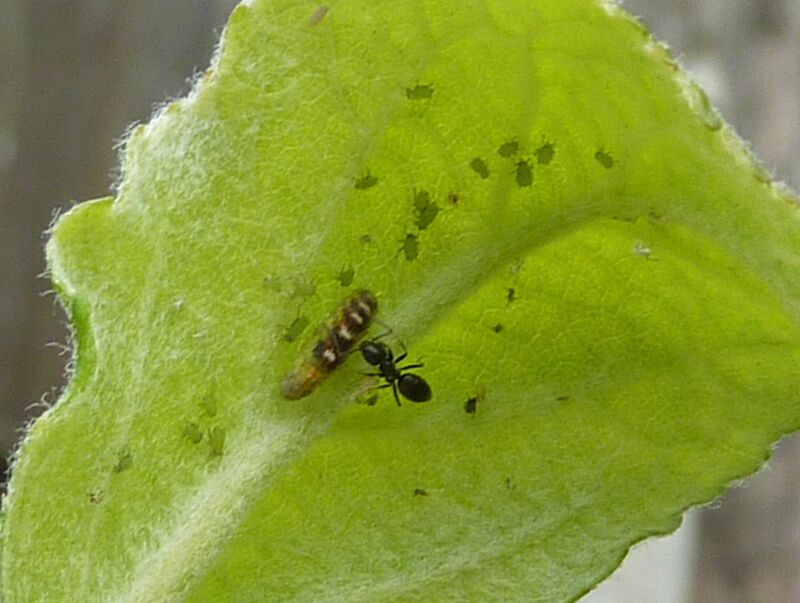 And at their best the ants are killing the insects or forcing them to jump ship and find another host plant. Even with ant protection though there are still predators that keep their populations in check. Here is a Hover Fly larva. They move thought the aphid herds nibbling on the aphids one by one for their season. (I find most of the aphids on the trees in my yard aren't present for more than a few months.) These grubs are overlooked by ant patrols that come to inspect and harvest the aphid dew. 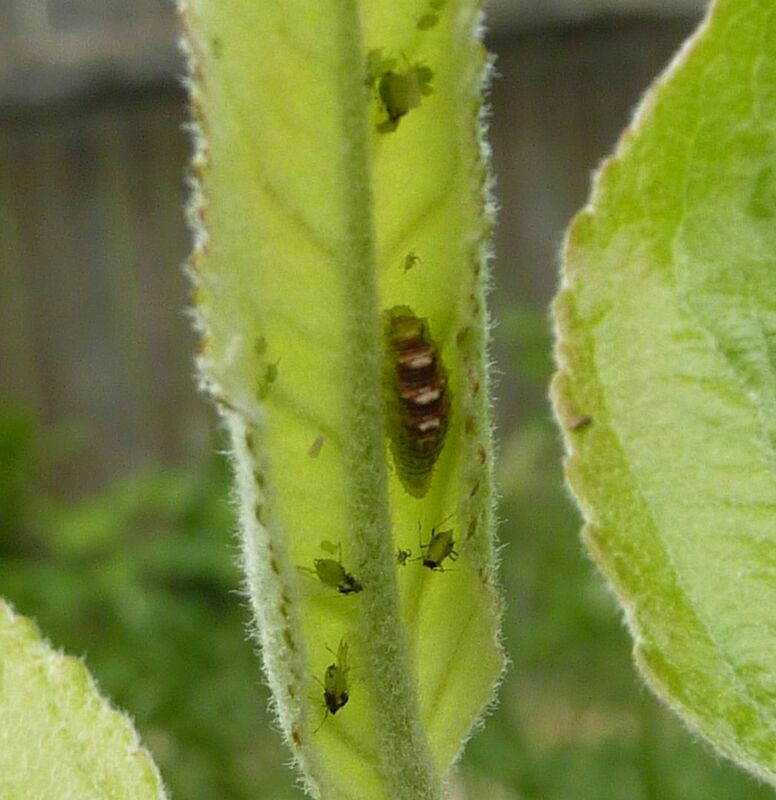 Even when they are discovered they're licked and cleaned as though they were an aphid or some odd growth on the tree. I've even seen ants inspecting the Hover Fly larva while in the act of eating an aphid. The ant didn't seem to care. When gardeners see aphids they like to believe they're being "organic" by turning to store bought lady bugs instead of chemicals. 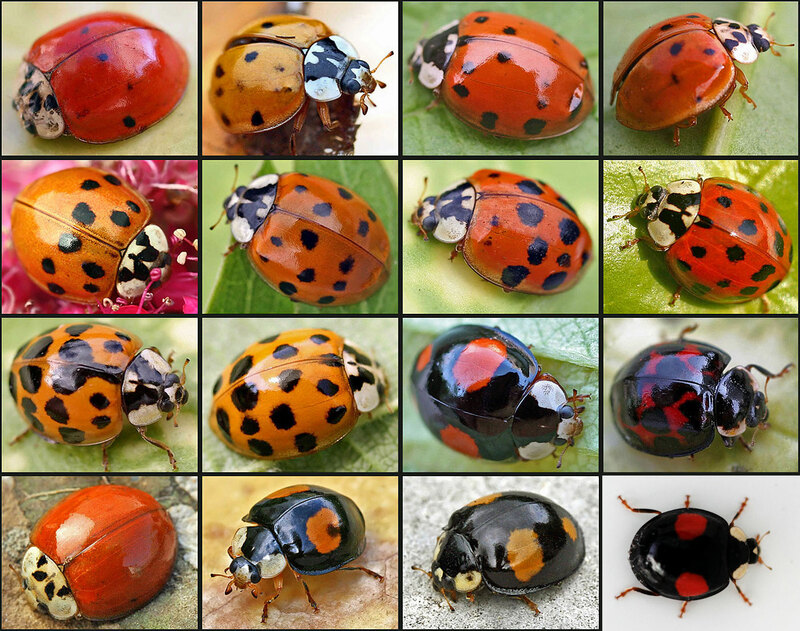 Harmonia axyridis has plaid one of the greatest tricks on the unknowing gardener's eyes. 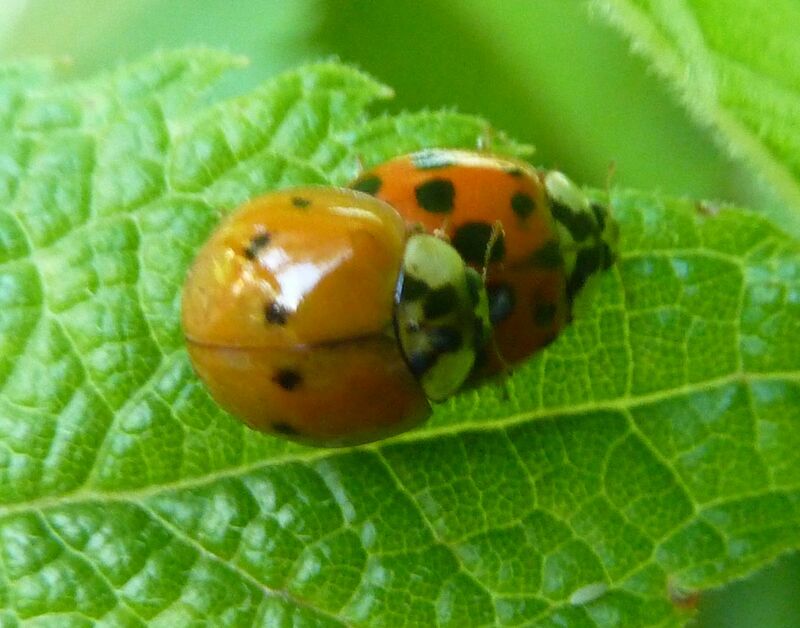 Pictured above are two ladybugs that are the same species, and currently in the act of mating. One is a dull orange color with very few spots. The other is a warmer orange red color with lots of dark spots. It's called the Asian Multicolored Ladybug. As you can see it comes in many colors. Note the thorax (the white part) and patterns of the spots. With few exceptions the spots are bigger on the darker forms. But the diversity of this one nonnative species has replaced 400 or so native species of lady bugs. Image Source. For images of ladybugs see BugGuide.net. 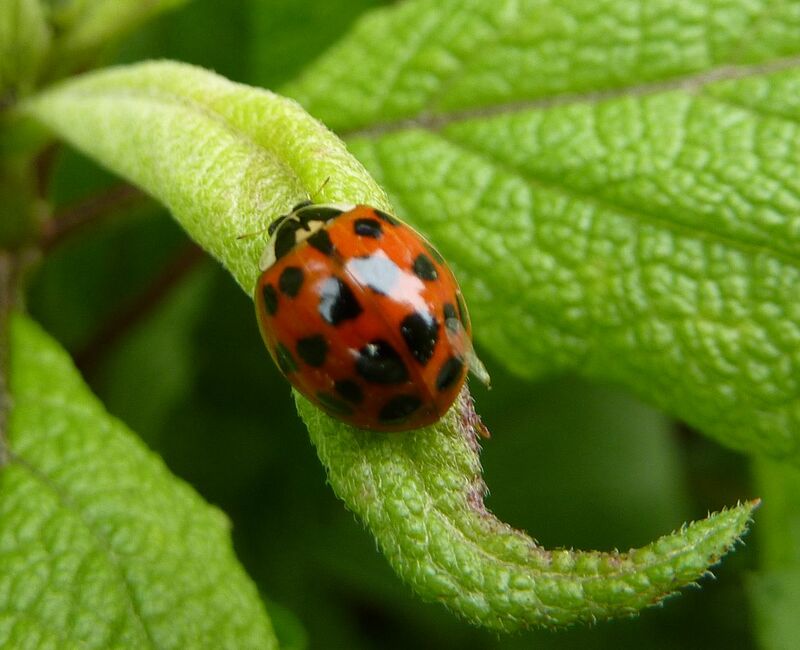 Before buying an invasive species of lady bugs, consider seeing if the aphids are a problem in the first place. If it's something you can just take a wet rag to and remove yourself why use the money? The lady bug they're selling in stores is invasive and bound to show up on it's own anyhow. 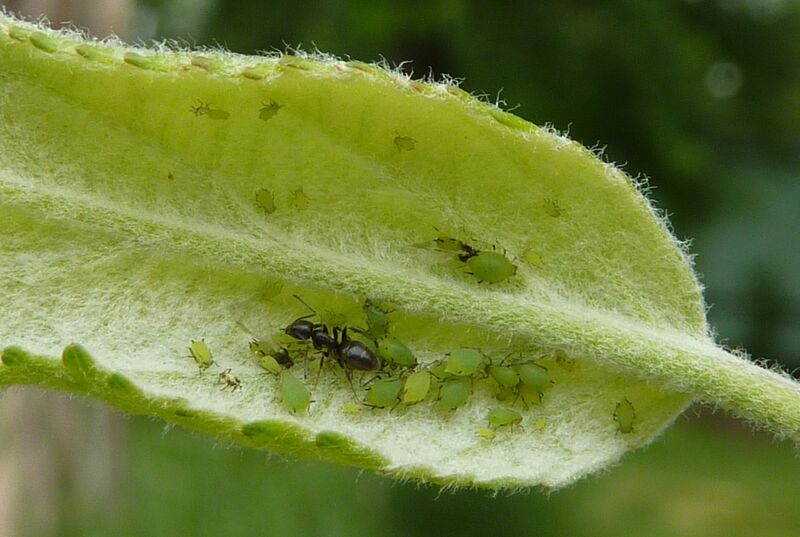 Bottom line, if you have aphids you should try and encourage beneficial insects to keep them under control.